Saturday 14 miles Long slow run of 14 miles. Averaged about 10 minutes / mile. Being that I was on vacation and resting a bunch of nagging injuries, the amount of running I did this week wasn't much. I am just so glad I had the wisdom to NOT register for a race this weekend. I was inches away from signing up for a half marathon before I left on vacation but decided not to on account that I had no idea what sort of shape I'd come back in. But with marathon training and some smart eating I know I'll get back to normal. Right now I am focusing on the Las Vegas Marathon which is about the 3rd weekend in November. If I feel I am ready to run something in October (i.e. a marathon) I'll do that. Whether it be another destination race or something, will remain to be seen. Either way, the extended break from running did help my knee. The first three days on the trip I could feel an occasional twinge but after 5 days at sea and no running, my knee quieted down. My calf, on the other has been a bit more problematic. While the discomfort is down significantly, I don't feel like it is 100%. The next probable race for me is the Ely Half Marathon. Before I left for vacation, I did book my hotel, but did not register for the race. This race is set for September 20th. I'll register for the race the week of. It looks like a small race (looking at last year's results) and I am sort of using it as a destination race. I'll spend two nights in Ely and hope to do some of the other tourist attractions. I also got an email about a price increase for the South Davis Thanksgiving 5K. It is the week after the Las Vegas Marathon (and held on my birthday, November 27th). So I plopped the money down on that. This morning's long run brought up a couple of photo opportunities. 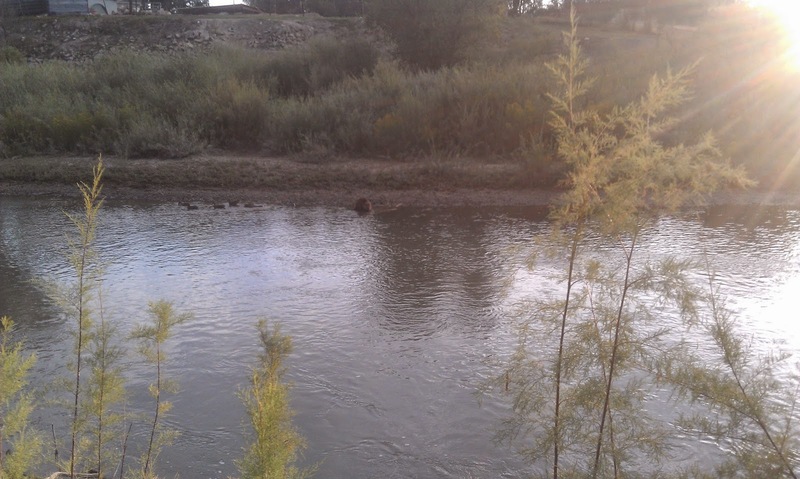 I spotted a beaver on the Jordan River Bike Trail. He was hanging around where the horse was last week and he was just minding his own business doing his thing. 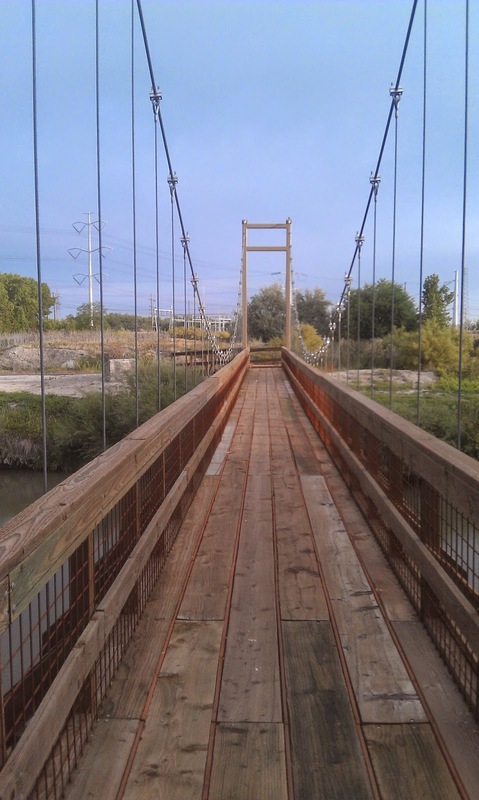 Since I ran 14 miles, I ran 7 miles out and at the 7 mile mark is a newly constructed pedestrian bridge. 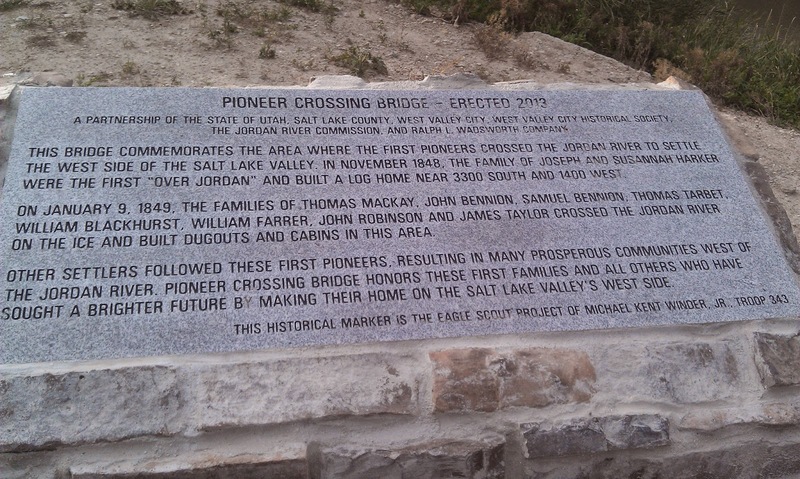 It connects the bike trail to a train station. While eating a gel I walked the wobbly bridge and got a picture of it.